Dutch star Rafael van der Vaart has been passed fit to return from a calf strain but Tottenham have a mounting injury list ahead of their trip to the San Siro Stadium. Gareth Bale, who scored a hat-trick against Inter Milan in the qualifying stages, is sidelined with a back problem while Tom Huddlestone, Younes Kaboul and Ledley King are also definitely out injured. Luka Modric is still recovering from appendicitis, Jermaine Jenas is banned as he serves a one-match suspension while Peter Crouch and Steven Pienaar are both doubtful. Internationals Mark van Bommel and Antonio Cassano are both unavailable for AC Milan’s last-16 Champions League clash against Tottenham as they are cup-tied. Midfielder Andrea Pirlo has been ruled out of both legs and will spend the next six weeks on the injury sidelines while veteran defender Alessandro Nesta is battling to recover from the effects of a dislocated shoulder. AC Milan: Abbiati; Oddo, Nesta, Thiago Silva, Antonini; Gattuso, Flamini, Seedorf; Pato, Ibrahimovic, Robinho. Tottenham: Possible starting XI: Gomes; Corluka, Dawson, Gallas, Assou-Ekotto; Lennon, Sandro, Palacios, Kranjcar; Van der Vaart; Defoe. I’m with you Len, USED ALL THE WAY! As Aury wrote above, the costs of owning a car are out in orbit, and we need to do the best that we can to cut it down as low as possible without sacrificing safety. Pues yo no sÃ© bien en que planeta estaba viviendo (ademÃ¡s de la luna) porque no habÃ­a "descubierto" tu cocina y ya me doy de topes con tantas cosas ricas!! !Este brownie debe estar muy bueno, a pesar de que no soy chocoadicta casi todos mis amigos y familia si que lo son, en especial a mi me gusta el chocolate en leche infusionada con picante…de este lado del charco el picante es imprescindible en casi todo.Y nada que te sigo desde hoy :DBesiÃ±os. MILAN is going to destroy tottenham!!! MILAN is ging to destroy tottenham !!! we need Pienaar in that formation !! otherwise we’ve got what it takes… Milan think it will be easy for them without Bale… go on Niko show em… carry on where Gareth left off at San Siro…. 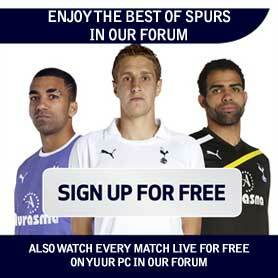 and they seem to forget a certain Aaron Lennon, who is coming back to top form just in time for this great run in….